Last month I attended the International Association of Eating Disorder Professionals Conference in Orlando, Florida. I had a great time learning more about new findings in the treatment of eating disorders and connecting with other clinicians. During the conference there is also an exhibit hall where treatment centers and businesses related to the care of eating disorders can provide information about their services. As a clinician it’s helpful to learn about the services that different treatment centers provide, what insurance they take, what makes program unique, and to even meet some of their administrative and clinical staff. 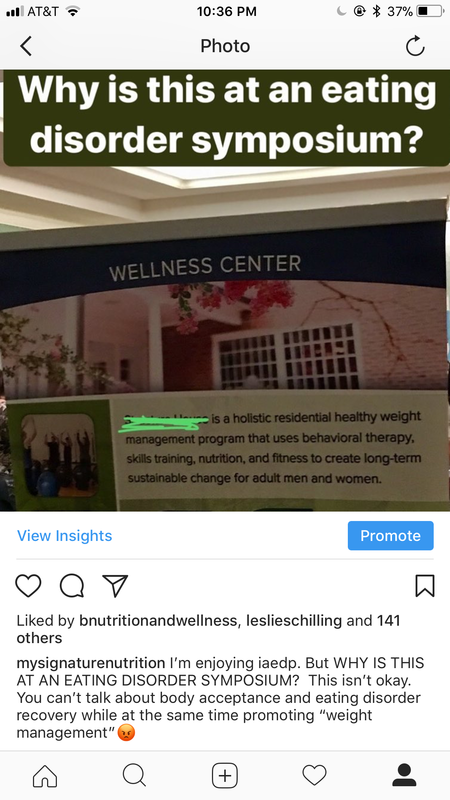 During the expo I noticed a booth for a treatment center that provided “weight management services” for the treatment of binge eating disorder, bariatric surgery, and diabetes. (I’m not even going to touch the stuff about bariatric surgery and diabetes.) I was disappointed, perplexed and outraged that this table would be permitted at the IAEDP conference because weight management is NOT the recommended treatment for binge eating disorder. In fact it’s contraindicated. Focusing on weight in treatment for binge eating- drives binge eating. Focusing on weight in the treatment of binge eating disorder reinforces that weight is the problem and perpetuates fat phobia and weight stigma. 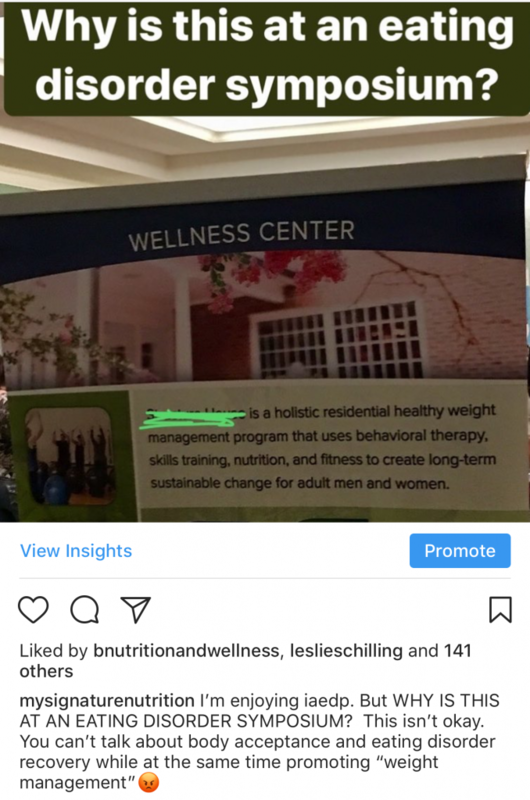 So being like any mid-30 something person I took a picture and posted on social media (image below) Why is this at an eating disorder symposium? Nearly 100 comments later I realized- 1.) People think I know nothing about eating disorders (NOT TRUE) and 2.) People are very confused about binge eating disorder (TRUE). 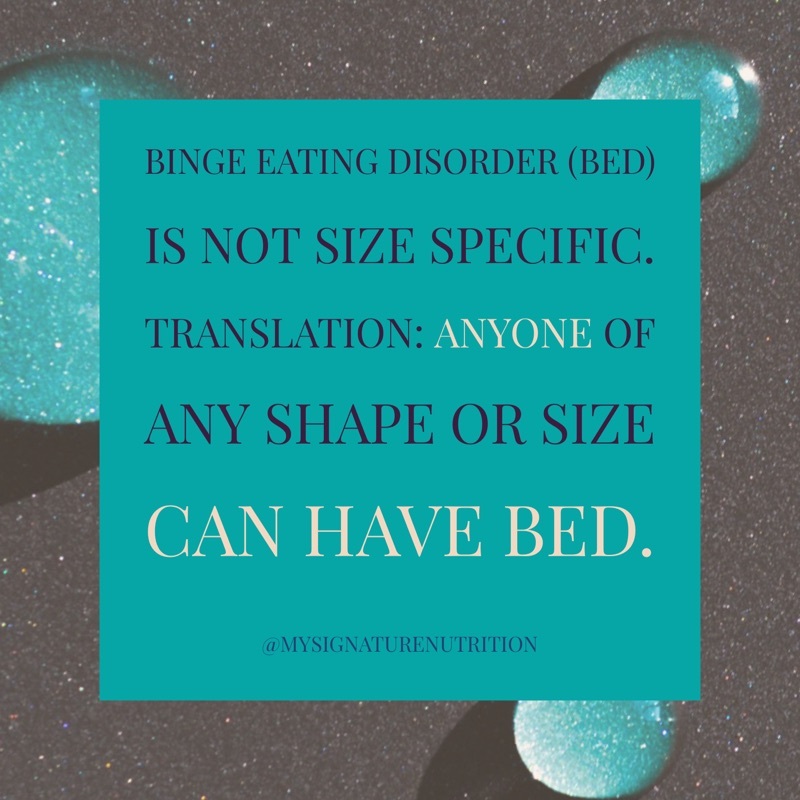 Binge Eating Disorder Is NOT Size Specific.ANYONE of any shape or size CAN HAVE BED. You cannot look at someone and tell if they have an eating disorder- including binge eating disorder. Binge eating disorder can impact anyone of any body shape or size. 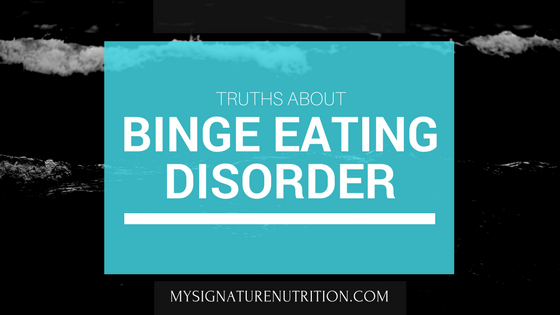 In fact, 30% of people with binge eating disorder will be at a “normal” weight. 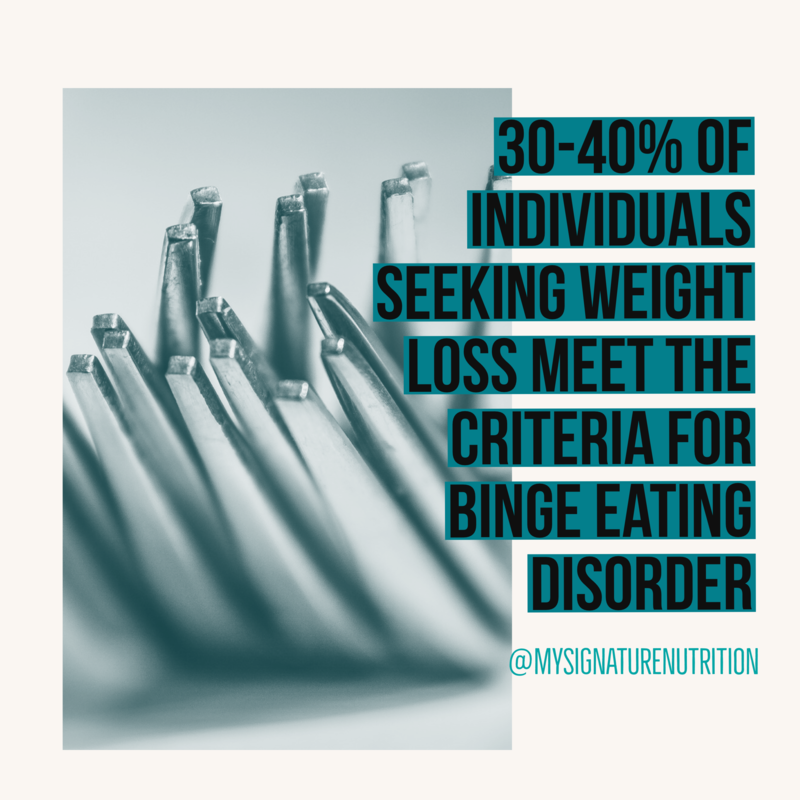 The Binge Eating Disorder Association (BEDA) says on their website, “ Binge eating disorder is NOT obesity: While it is estimated 70% of those who suffer from BED are obese, not everyone who has BED is obese. The “cure” is not to lose weight. In fact, prescribing weight loss strategies further entrenches the disorder causing intense shame and resulting in weight gain.” Furthermore, the belief that only people in larger bodies binge eat perpetuates weight stigma and fat phobia. The Desire to feel In Control: When you feel out of control with food, the solution feels like you need to be more “in control” with food. Diet culture says to be more “in control” with food that you need to restrict your eating or diet, which leads right on back to bingeing. This creates a vicious cycle that ends of driving more binge behaviors. Lack of physical hunger: When you’re bingeing at night you may truly wake up the next day and not be hungry so you don’t eat. This delay of eating sets you up to be over hungry later and sets the stage for a repeated pattern of bingeing. Fear of bingeing:The fear that you if you start eating you won’t stop often results in restricted eating. The thought that you won’t be able to stop eating results in delayed eating, meaning you know you should eat, but you wait and wait and wait until you get over hungry and by they time you start eating you end up bingeing. Of course when this happens the binge behaviors reinforce the belief that you get out of control with food which sets you up to repeat the same pattern. 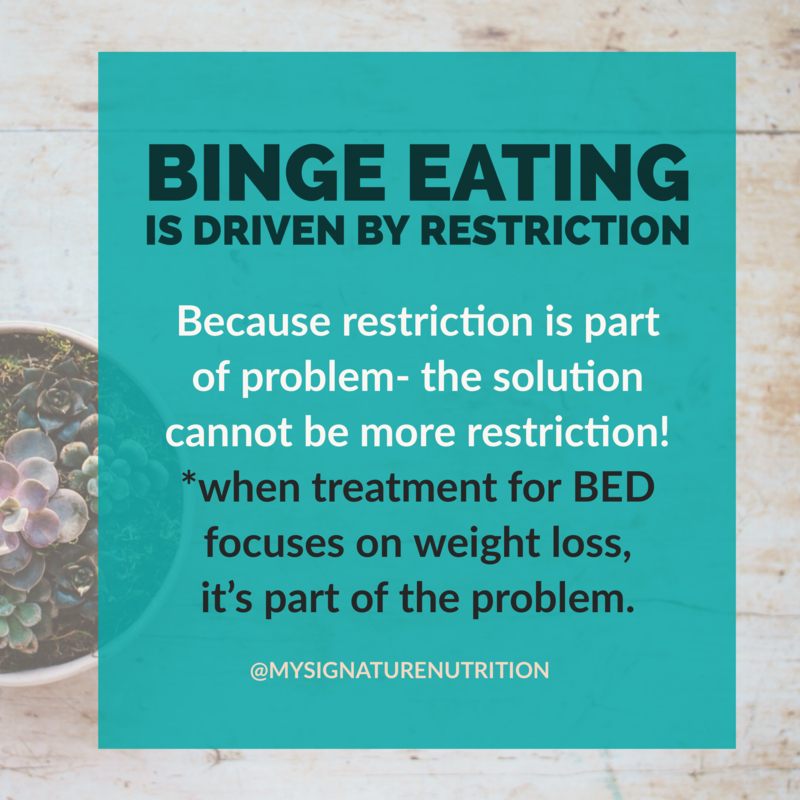 Fear of bingeing anyways: Restriction also appears with binge eating when you fear that you’re going to binge later anyways so you don’t eat during the day to “save up”. On some level this feels “safer” and like it gives you permission to binge. You’re worried that if you do eat during the day then you’re going binge anyways and so what’s the point. In the end, you don’t eat. Again restriction drives bingeing. Body and Weight Focus: While not everyone with binge eating disorder is in a larger body, everyone with binge eating disorder is focused on their body. This is true of any eating disorder. There is increased focus on body weight, shape or size and the desire to lose weight or change your body. When the solution to changing your body is dieting or weight loss, attempts at changing your body (restriction) will lead right on back to bingeing. If bingeing leads to weight gain, or even perceived weight gain, then there’s even more weight focus, which drives more desire to restrict, and thus binge eating. Weight/Body Focusàrestriction àdeprivation/biological hunger à(emotions)àbinge eating. *I’m not getting into the emotional part of bingeing, there certainly is one, but it’s difficult if not impossible to figure out other factors that drive bingeing (like thoughts, emotions, habit) when you’re not eating enough food. You can also think about it like this. 1. Hold your breath as long as possible. Time it. 2. How long did you hold your breath? 3. What was it like when you took your first breath again? Was it normal breathing? (If so you probably didn’t hold as long as possible.) NO! It was a gasping, deep, breath that maybe even went to the core of your body. You may have even had to take deeper breaths for a period of time before breathing went back to normal. Did you binge on air? No- it was a natural reaction to oxygen deprivation. Did you beat yourself up about needing more oxygen? Probably not- because you recognized that it was necessary for survival. The same thing happens with food. 30-40% of people seeking weight loss struggle with binge eating. The underlying belief from diet culture, friends, families and misinformed professionals, is that if you lose weight and “control” your eating then the bingeing will stop. Of course this couldn’t be more false. The truth is that focusing on your body and weight loss only drives more binge behaviors. You might be able to lose weight in the short term, but will gain weight back in the long term. You might find that binges decrease in the beginning, but they’ll be back with a vengeance later on. We know that restriction actually predicts binge eating. For this reason, focus on weight loss as treatment for binge eating disorder is harmful and unethical. Focus on weight loss as “treatment” for binge eating disorder is harmful and unethical. In diet culture, there is this underlying belief that recovery from BED is synonymous with weight loss and treatment recommendations from will intentioned family, friends, and non-eating disorder savvy professionals are often made in support of that mistaken goal. Because binge eating is driven by restriction the goal of weight loss as recovery leads back to more bingeing. 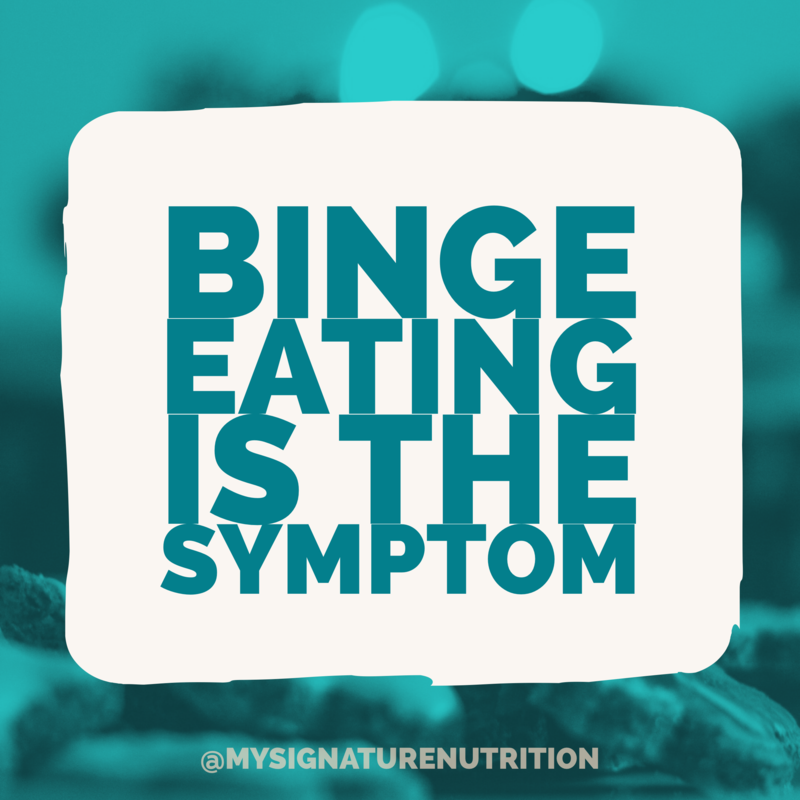 Remember, the bingeing is a symptom, not the problem. The problem is the restriction. Because restriction is the problem- the solution cannot be more restriction! Even worse- when someone is in treatment for BED and following harmful treatment recommendations that focus on weight loss- it will result in an even deeper level of shame. It’s easy to see that in the long run “treatment” won’t work, but as a human being- there’s an even greater sense of failure when you go to a treatment program that’s supposed to “cure” your binge eating only to result in more binge eating and potentially weight gain. If you’re like most people, you likely stop seeking treatment or believe that you need an even more extreme restrictive pattern of eating to help you stop. Perhaps even bariatric surgery. Newsflash: You can have bariatric surgery and still binge eat. You can have bariatric surgery multiple times and still struggle with binge eating. Weight management is a diet. The diet industry knows that you know that diets don’t work, that diets are harmful. So, the crafty folks that they are, they shift the focus off of overt dieting and weight loss to wellness and weight management. 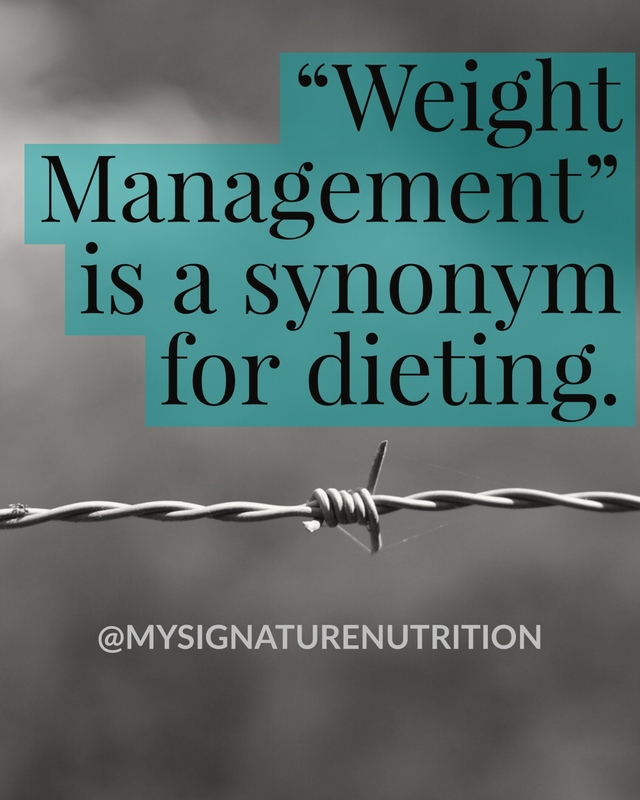 In reality- weight management is a synonym for dieting. Maybe a euphemism- but still a diet. It doesn’t matter what you call it, how pretty it’s packaged, or how it’s sold- IT’S STILL A DIET. NO, no, no. That cannot happen. When I reflect back on the time I struggled with my eating, the disordered part of me would’ve LOVED this program. It would’ve made me feel safe in that I could restrict and recover. NOPE. That cannot happen. Restriction will never get you out of an eating disorder. Focus on weight will never get you out of an eating disorder. Hating yourself will never get you out of an eating disorder. These things are part of the problem and will never be the solution. That’s why I was so frustrated to see this “treatment center” at an IAEDP conference because it’s completely unethical and harmful. Want to see more images like those included in this post? Find me on instagram @MySignatureNutrition or Facebook.